It's the time of learning and discovery! Welcome to the Renaissance. 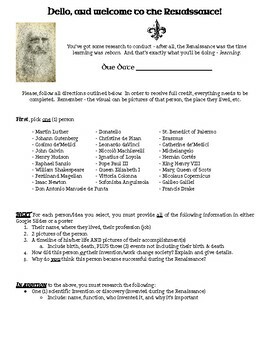 For this project, I listed 29 individuals who were relatively well known during this time that students need to research. (2-3 are 'lesser known' but still relatively cool to view to add variety!) I've outlined what it is they are to research so they know which direction to go in. Also, they are to research a new advancement/discovery that came about during this time and briefly talk about it.